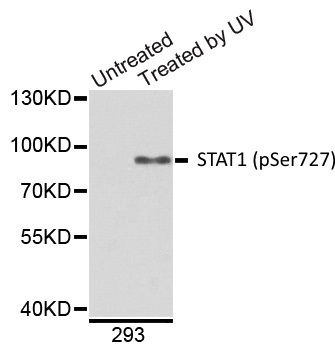 Rabbit anti STAT1 (pSer727) antibody recognizes signal transducer and activator of transcription 1-alpha/beta (STAT1) also known as transcription factor ISGF-3 components p91/p84, when phosphorylated at serine 727. STAT1 is part of the transcription factor STAT family of proteins. STAT proteins form homo- or hetero-dimers once phosphorylated by receptor associated kinases. Following dimerization STAT proteins then translocate to the cell nucleus. Phosphorylation of STAT1 at serine 727 occurs via p38 MAPK (MAPK14) pathways (Ramsauer et al. 2002). Antiserum to STAT1 (pSer727) was raised by repeated immunization of rabbits with highly purified antigen. 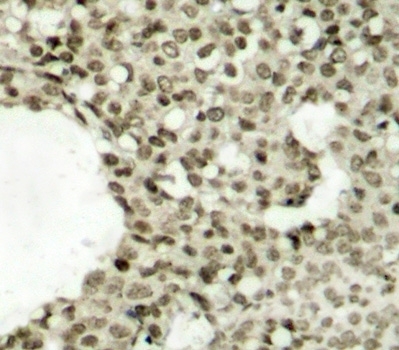 Purified IgG was prepared from whole serum by affinity chromatography. Ramsauer, K. et al. (2002) p38 MAPK enhances STAT1-dependent transcription independently of Ser-727 phosphorylation. Proc Natl Acad Sci U S A. 99 (20): 12859-64.